Acute right heart failure in chronic precapillary pulmonary hypertension is characterised by a rapidly progressive syndrome with systemic congestion resulting from impaired right ventricular filling and/or reduced right ventricular flow output. This clinical picture results from an imbalance between the afterload imposed on the right ventricle and its adaptation capacity. Acute decompensated pulmonary hypertension is associated with a very poor prognosis in the short term. Despite its major impact on survival, its optimal management remains very challenging for specialised centres, without specific recommendations. 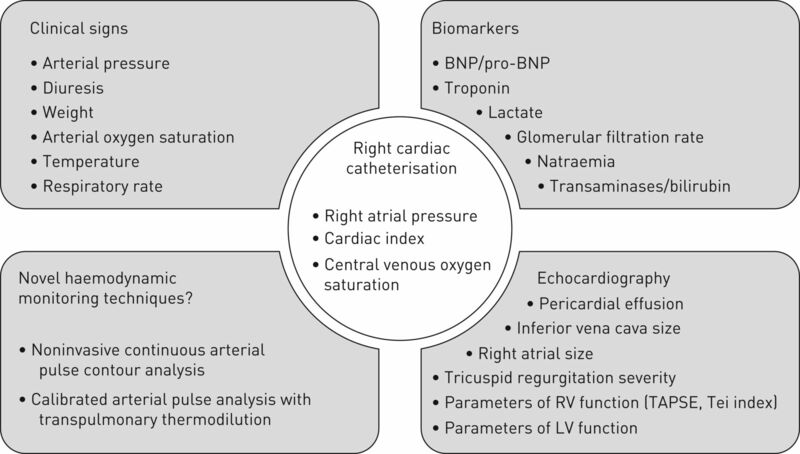 Identification of trigger factors, optimisation of fluid volume and pharmacological support to improve right ventricular function and perfusion pressure are the main therapeutic areas to consider in order to improve clinical condition. At the same time, specific management of pulmonary hypertension according to the aetiology is mandatory to reduce right ventricular afterload. Over the past decade, the development of extracorporeal life support in refractory right heart failure combined with urgent transplantation has probably contributed to a significant improvement in survival for selected patients. However, there remains a considerable need for further research in this field. Precapillary pulmonary hypertension defines a group of disorders characterised by a progressive increase in pulmonary vascular resistance (PVR) that develops as a result of abnormal remodelling of the pulmonary microvasculature [1–3]. Improved understanding of the pathophysiology of precapillary pulmonary hypertension has led to the development of several medications that primarily target endothelial dysfunction . Despite these major advances, pulmonary hypertension remains a progressive and fatal disease leading to right ventricular dysfunction and death [5, 6]. The ability of the right ventricle to adapt to the progressive increase in afterload is closely linked to the functional status and prognosis of patients . Progressive right ventricular dysfunction plays a key role in the insidious development of clinical symptoms. Impaired cardiac output and elevation in central venous pressure are associated with functional deterioration, onset of congestive signs and ultimately with mortality in patients with advanced pulmonary hypertension. The prognostic importance of right ventricular function has been underappreciated for a long time and most major clinical studies have focused on the pulmonary circulation as the therapeutic target in precapillary pulmonary hypertension. However, there has been a renewed interest in recent years in the analysis of the pathophysiology of right ventricular remodelling and dysfunction. End-stage pulmonary hypertension is characterised by maladaptive right ventricular remodelling, leading to a fall in cardiac output and a right ventricle–arterial uncoupling. This condition is associated with a high risk of acute right heart failure, which has been defined as a rapidly progressive syndrome with systemic congestion resulting from impaired right ventricular filling and/or reduced right ventricular flow output . The occurrence of right heart failure remains the most frequent cause of death with a dismal prognosis over the short term, highlighting the need for earlier recognition and better management options. This article aims to provide a comprehensive review of the state of the art in acute decompensated pulmonary hypertension. The functional prognosis of patients and their survival is closely related to the right ventricle's ability to adapt to the progressive increase in afterload. The natural history of precapillary pulmonary hypertension is one of successive stages, the characteristics of which are mainly related to right ventricular function (figure 1). The initial asymptomatic phase is mainly characterised by the development of progressive pulmonary vascular remodelling. Very rapidly, an increase in pulmonary pressures and PVR will gradually modify the geometry and function of the right ventricle. Chronic adaptation of the right ventricle to an excessive afterload begins with a concentric myocardial hypertrophy in order to maintain right ventricle wall stress and the cardiac output. According to Laplace's law, an increase in right ventricular endocavitary pressures is associated with an increase in parietal stress that can be compensated by concentric hypertrophy. The observed adaptations at this stage are the results of cellular and molecular changes characterised mainly by an elongation of sarcomeres and an increase in protein synthesis within cardiomyocytes . At the molecular level, cytoskeleton reorganisation could play a key role in the compensatory hypertrophy of the right ventricle . In addition, a change in contractile protein isoforms has been observed . In the second stage, the right ventricle dilates in response to increased pressures. This right ventricular eccentric enlargement has the physiological effect of reducing the tension on the free wall . Eccentric hypertrophy of the right ventricle, combined with an excessive dilatation of the right-sided cavities, is often reflective of a less favourable adaptive phenomenon . This phenotype corresponds to the end-stage phase of pulmonary hypertension that is characterised clinically by the occurrence of severe dyspnoea (i.e. functional class III or IV) and a risk of syncope and haemodynamically by chronic elevation of right atrial pressure and a decrease in the cardiac output. All of these parameters are closely associated with poor prognosis in precapillary pulmonary hypertension . The excessive dilatation of the right ventricle leads to several phenomena that contribute to the precipitation of cardiac and circulatory failure. First, the septal curvature is reversed and then becomes convex towards the left ventricle, which alters left ventricular diastolic function . Additionally, dilatation of the right ventricle contributes to an increase in tricuspid valve insufficiency, leading to an increase in right atrial pressure and a decrease in the left ventricle preload. Finally, the end-stage phase of precapillary pulmonary hypertension is characterised by severe impairment of ventriculo-arterial coupling that results in inefficient transfer of energy from the myocardium to the downstream pulmonary arterial circulation . Gradual evolution towards end-stage pulmonary hypertension. RV: right ventricle; PVR: pulmonary vascular resistance; CI: cardiac index; RAP: right atrial pressure; NYHA-FC: New York Heart Association functional class; RVF: right ventricular failure. The capacity of the right ventricle to adapt to the progressive increases in afterload varies considerably from one individual to another and from one aetiology of pulmonary hypertension to another. The reasons for differences in individual susceptibility to develop adaptive mechanisms are still unknown. Depending on the aetiology of pulmonary hypertension, the ability of the right ventricle to adapt to increased PVR seems to be altered. In cases of Eisenmenger syndrome, the right-sided cavities preserve a fetal phenotype characterised by significant hypertrophy of the right ventricular walls. Right-to-left shunting helps to discharge the right ventricle and preserve it from excessively high endocavitary pressures . In contrast, in the setting of scleroderma, a much more important alteration of the right ventricular function can be observed for lower levels of PVR. Primary myocardial involvement may participate in early impairment of the right ventricle in these patients . Acute decompensated pulmonary hypertension is characterised by sudden worsening of clinical signs of right heart failure with subsequent systemic circulatory insufficiency and multisystem organ failure. This clinical picture results from an imbalance between the afterload imposed on the right ventricle and its capacity for compensation. Acute right heart failure can be precipitated by an external trigger factor or can be a manifestation of disease worsening. Whatever the aetiology, the short-term prognosis is very poor [17–24]. Acute decompensation of pulmonary hypertension may combine a sudden aggravation of both diastolic and systolic right ventricular insufficiency. Diastolic failure promotes worsening congestive signs that may lead to anasarca. Right ventricular systolic failure results in a sharp decrease in left ventricular preload and a decrease in cardiac output followed by low peripheral perfusion pressure. The combination of systolic and diastolic right ventricular failure in most severe patients promotes the sudden installation of multiple organ failure, foremost of which are kidney, hepatic and gut dysfunction. The pathophysiological mechanisms of acute renal dysfunction during acute decompensation of pulmonary hypertension are similar to those observed in type I cardiorenal syndrome . Acute worsening of renal function in the context of decompensated pulmonary hypertension has been strongly related to mortality in numerous studies [17, 21, 22, 26]. As in left heart failure, the renin-angiotensin-aldosterone and the sympathetic nervous systems are stimulated, leading to a worsening of peripheral vascular resistance and sodium and water retention . In type I cardiorenal syndrome, significant stimulation of antidiuretic hormone promotes excessive retention of free water, leading to volume overload and hyponatraemia. These combined phenomena contribute to a decrease in renal perfusion due to both arterial vasoconstriction and venous congestion. In the physiological state, the right ventricular coronary perfusion is systo-diastolic, the aortic pressure being higher than the systolic pressure of the right ventricle. In the case of acute right ventricular decompensation, the fall in cardiac output and the resulting acute circulatory failure may favour ischaemia of the right ventricle by compromising the systolic component of coronary perfusion. Clinical studies have demonstrated the very strong impact of acute pulmonary hypertension decompensation on short-term prognosis (table 1). Depending on the type of population studied, in-hospital mortality varies from 14% to 100% [17–24]. This large variability in mortality is mainly due to the heterogeneity of the population studied, in terms of severity at admission. The need to use catecholamines to optimise cardiac output and peripheral perfusion pressures is logically associated with a higher mortality rate. The prognostic factors identified in all studies are most often reflective of multiple organ failure induced by cardiac and circulatory failure (table 1). For example, renal function is consistently associated with poor prognosis. Future studies are needed to identify more early prognostic factors in order to anticipate the occurrence of refractory right heart failure, for which major advances have been developed during recent years, such as extracorporeal life support (ECLS) combined with urgent transplantation. 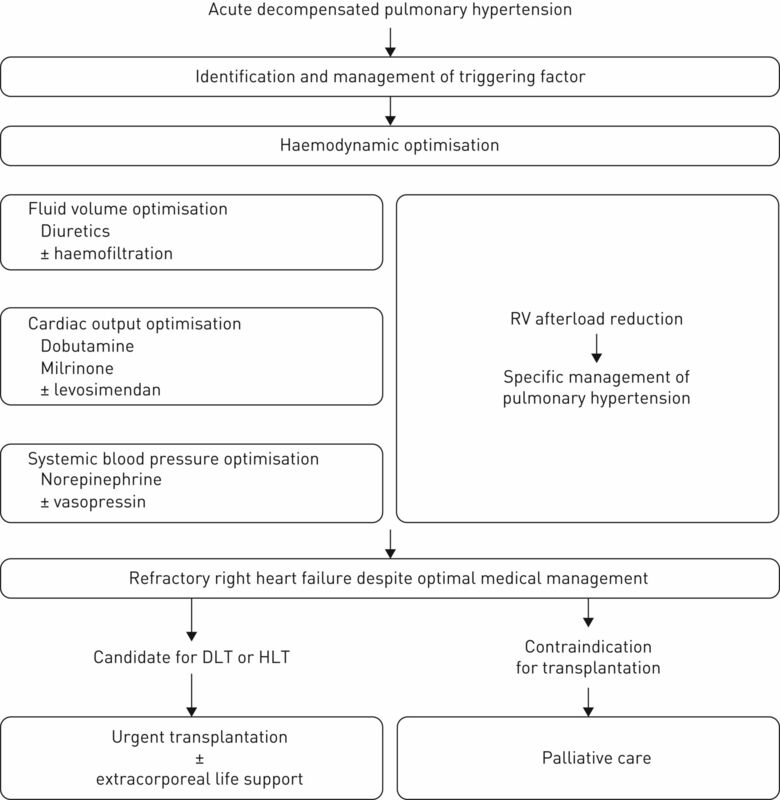 The optimal management of acute decompensated pulmonary hypertension remains challenging, even for specialised centres (figure 2). The major impact of this clinical scenario on prognosis requires close monitoring of patients in an intensive care unit (ICU). Despite the potentially catastrophic consequences of acute right ventricular failure on the immediate survival of patients and the therapeutic issues developed in recent years, very few scientific data are available to guide the management of this clinical situation. The therapeutic recommendations are mainly based on animal studies, expert opinions or case series reported in the literature. Management of acute decompensated pulmonary hypertension. RV: right ventricle; DLT: double lung transplantation; HLT: heart–lung transplantation. Previous studies have indicated that a trigger factor is identified in 20–40% of acute episodes of right heart failure in pulmonary hypertension [17, 21]. In addition, trigger factors in this setting have been frequently identified as aggravating factors associated with a poorer prognosis . Supraventricular arrhythmias are often observed in patients with acute decompensation; however, it is often difficult to determine whether it is the cause or the consequence of right heart failure. Supraventricular arrhythmias are mainly triggered by hypervolaemia and right heart cavity dilatation, which is associated with a poor prognosis in chronic pulmonary hypertension . It contributes to decreased stroke volume and may precipitate circulatory failure. The use of β-blockers and calcium channel inhibitors must be avoided, because of their deleterious inotropic effects on right ventricular function . Medical cardioversion with amiodarone may be considered a first-line option under the cover of anticoagulation . In cases of atrial flutter, radiofrequency ablation may be an option to reduce the risk of recurrence . The identification of an infectious trigger is associated with a poorer prognosis and must be detected and managed promptly . Two specific situations can be observed in acute pulmonary hypertension decompensation. In patients treated with intravenous epoprostenol or treprostinil, bacteraemia due to catheter infection must be systematically screened for, even in the absence of general clinical signs of infection. Insidious sepsis due to Micrococcus or Staphylococcus epidermidis can precipitate right heart failure . As in left heart failure, a systemic inflammatory response syndrome may result from bacterial translocation from the gut secondary to low cardiac output combined with an increase in venous pressure, the occurrence of which is associated with poor outcomes . Other potential trigger factors include a new thromboembolic event, especially in patients with chronic thromboembolic pulmonary hypertension. Investigations for thromboembolism should be pursued according to the clinical probability and patient anticoagulation status. Noncompliance with specific pulmonary arterial hypertension (PAH) therapies are probably relatively rare, but must be discussed with patients. Deviations from the salt-free diet are more frequently observed, requiring additional patient education and reinforcement of the importance of salt restriction. Haemodynamic optimisation in acute pulmonary hypertension decompensation is mainly based on fluid volume management and, if necessary, pharmacological support to improve cardiac function and coronary perfusion pressure. Cardiac performance in pulmonary hypertension is closely related to the right ventricular preload, the prognostic value of which has been known for many years [5, 34]. In the physiological state, the high compliance of the right ventricle ensures the maintenance of a low right atrial pressure, which maintains systemic venous return and thus preserves the cardiac output. In pulmonary hypertension, right ventricular diastolic dysfunction promotes sodium and water retention, which may be considerable in the setting of acute decompensated pulmonary hypertension. Intravenous diuretics are used as a first-line treatment in order to obtain a negative fluid balance and to optimise blood volume, and consequently reduce right ventricular preload. The aim of reducing right ventricular preload is to diminish right–left ventricular interdependence and thus improve left ventricular diastolic function, reduce tricuspid insufficiency and reduce organ congestion, all of which contribute to the development of the cardiorenal syndrome. A major challenge is to accurately assess and monitor right ventricle preload in these patients in order to determine the optimal filling volume for each of them, as both hypovolaemia and hypervolaemia are deleterious to cardiac function. Diuretic treatment alone may be insufficient to regain a state of equilibrium and to emerge from the episode of acute decompensation. In cases of severe right ventricular systolic dysfunction, a severely impaired cardiac output may require the use of inotropic agents. The main goal of inotrope use is to improve cardiac output and ventriculo-arterial coupling without increasing right ventricular afterload [35, 36]. There are few specific clinical trials evaluating inotropic agents in the setting of acute decompensated pulmonary hypertension. β1-adrenergic agonists remain the inotropic agents of choice, even though impaired inotropic responses to β1-adrenergic receptor agonists have been observed in preclinical studies due to downregulation and desensitisation of β1-receptors in right ventricular hypertrophy . Dobutamine is most often initiated at low doses (2.5 µg·kg−1·min−1) and progressively uptitrated in patients with persistent signs of low cardiac output. Dobutamine was effective in improving ventriculo-arterial coupling in an experimental model of acute occlusion of the pulmonary artery. However, the use of doses >10 µg·kg−1·min−1 can be deleterious by precipitating a decrease in systemic arterial resistance without improving cardiac output. Alternative options to dobutamine include newer inotrope/vasodilators such as milrinone or levosimendan. Milrinone is a phosphodiesterase-3 inhibitor, which increases myocardial contractility and reduces left ventriclar afterload. In some studies, milrinone has been shown to reduce PVR . Data on levosimendan are entirely experimental; however, it has been shown to be more effective than dobutamine for improving ventriculo-arterial coupling in preclinical studies [39, 40]. In the most severely affected patients, systemic vascular resistance is low at admission or decreases after the initiation of diuretics with or without inotropic agents. This condition is generally associated with multiorgan failure and right ventricular ischaemia. The use of vasopressors such as norepinephrine is necessary in this situation to restore a normal perfusion pressure. In addition to its effect on systemic blood pressure, norepinephrine could help to improve right ventricular function and right ventricle–pulmonary artery coupling . At low doses, vasopressin may have vasodilatory effects on the pulmonary circulation, and some clinical cases of vasopressin use as rescue therapy in pulmonary hypertension have been published. At higher doses, vasopressin may paradoxically increase PVR and cause adverse myocardial effects . Reduction of right ventricular afterload is a key point in the management of decompensated pulmonary hypertension. Escalating or initiating targeted management of the underlying chronic disease is the only way to definitively emerge from a situation of acute right heart decompensation and avoid recurrences in the long term. For cases of acute right ventricular insufficiency as the first presentation of chronic pulmonary hypertension, the aetiological assessment must be performed urgently to adapt specific management. For PAH, all targeted therapies can be considered in combination, including preferential use of an intravenous prostaglandin analogue. Upfront triple combination therapy has been shown to dramatically improve the long-term prognosis of patients with severe PAH with low cardiac index at baseline . In patients already undergoing treatment before the onset of an acute decompensation, the possibility of treatment reinforcement must be considered in each case. Because of their vasodilatory effects, these drugs can contribute to a decrease in the systemic arterial resistance. It is probably better to introduce them gradually with progressive increases in doses and after restoring haemodynamics. In specific cases of right heart failure due to PAH associated with systemic lupus erythematosus or mixed connective tissue disease, dramatic clinical and haemodynamic improvement has been reported with the use of corticosteroid and cyclophosphamide in combination with specific PAH therapies [42, 43]. Pulmonary veno-occlusive disease is a condition characterised by a dismal prognosis, which may deteriorate dramatically when treated with PAH-targeted therapies. In this setting, the possibility of double lung transplantation must be considered early in management . The possibility of urgent surgical endarterectomy must be considered carefully in cases of chronic thromboembolic pulmonary hypertension. When lesions are too distal, the risk of surgery is elevated, especially in patients with right heart failure, and medical treatment and/or balloon pulmonary angioplasty must be considered instead . In cases of group 5 pulmonary hypertension, the specific management of pulmonary hypertension must be discussed on a case-by-case basis according to the associated disease. Despite maximal management in the ICU, acute decompensation can be irreversible, with persistent heart and circulatory failure. Very important advances have been developed in the management of right heart failure refractory to optimal medical therapies. This condition was systematically fatal, until the development of rescue therapies combining ECLS devices and urgent transplantation. Transplantation remains the single option in patients with precapillary pulmonary hypertension and severe right heart dysfunction refractory to optimal medical therapy. ECLS is essential to perform lung or heart–lung transplantation in pulmonary hypertension because of the pre-existing right heart failure, in contrast to other indications for lung transplantation. The frequent occurrence of acute right heart decompensation in patients with PAH translates to a trend of a higher death rate on the transplant waiting list. Moreover, it has been reported that primary graft dysfunction and 1-year mortality rates after transplantation are higher in PAH than in other indications for transplantation. To decrease waiting-list deaths, most countries have revised transplant allocation rules during the past decade. In the USA, an algorithm based on a lung allocation score determined at list registration was implemented in May 2005 , which was followed by improved outcomes in patients with idiopathic PAH . Nevertheless, these patients remained at higher risk of death compared with other patients on the transplantation waiting list . The main factors used in the lung allocation score do not correlate with the severity of right ventricular dysfunction. Recently, a modified lung allocation score was proposed, including a mean right atrial pressure ≥14 mmHg and a 6-min walking distance ≤300 m, in order to improve the relative weighting of PAH severity at time of listing . The impact of this revised score will be evaluated in the future. A system of allocation score at time of listing has been also adopted in some European countries such as Germany. In addition, an exceptional Eurotransplant lung allocation score has been proposed for patients with severe right heart failure, in order to reduce the time and risk of mortality on the waiting list [50, 51]. In other countries, such as France, another system based on a high-priority allocation programme has been developed, rather than an initial score at time of listing. In cases of life-threatening conditions such as acute decompensated pulmonary hypertension requiring the use of catecholamines, a national priority access to transplantation can be obtained for a period of 8 days, which is renewable once if necessary. The overall survival of double lung or heart–lung transplantation candidates was significantly better after implementation of the high-priority listing, owing to a large increase in cumulative transplantation incidence combined with a significant decrease in waiting list deaths, with no worsening of postoperative outcomes . Each of these systems has advantages and disadvantages. Lung allocation scores must be revisited and improved to minimise the risk of acute decompensation on the waiting list. The high-priority allocation programme necessitates scrupulous follow-up of the indications for national priority access to transplantation in order to avoid a progressive increase of waiting times on the conventional list, especially in other indications for lung transplantation that cannot benefit from this system, such as chronic obstructive pulmonary disease. Importantly, the availability of a high-priority listing should not delay registration on the conventional transplant waiting list for patients with pulmonary hypertension. ECLS is another major advance in the management of refractory right heart failure due to decompensated pulmonary hypertension . In a very large majority of cases, ECLS is introduced as bridge to urgent transplantation. Exceptional cases of ECLS used as a bridge to recovery have been reported . The indications for ECLS in the context of severe PAH should be discussed on a case-by-case basis, preferably in an expert centre with experience in the management of severe pulmonary hypertension. Because of potentially serious complications, the use of circulatory support must be reserved only for selected patients at high risk of imminent death with a plan for lung transplantation. In practice, these devices must be initiated only in cases of right heart failure refractory to optimal medical management including catecholamine support and optimal specific medical treatment of PAH, and after having approved a project of lung or heart–lung transplantation. The impact of ECLS devices as bridge to transplantation on survival in the specific indication of PAH has been reported poorly in the literature, despite the growth of this management approach in most countries. De Perrot et al. reported six pulmonary hypertension cases bridged to transplantation with ECLS and suggested that this aggressive management could have a major impact on reducing waiting-list mortality. Veno-arterial extracorporeal membrane oxygenation (ECMO) is the device that is most frequently used in decompensated PAH. The main advantage of this system is the possibility of initiating it without general anaesthesia (which constitutes a major risk of death in such patients). Venous and arterial cannulas are introduced most often in a femoral vein and artery under local anaesthesia in the ICU. ECMO leads to an immediate reduction in right ventricular afterload and restores systemic arterial pressure, thereby improving organ perfusion. The circulatory output is maintained by a pump, which necessitates the use of anticoagulation. Therefore, the major complications of ECMO are the risk of bleeding, but also lower-limb ischaemia and systemic infection. For these reasons, time under ECMO must be optimised and systematically combined with a plan for urgent transplantation, or exceptionally with rapid recovery of right ventricular function. Use of the Novalung system (Novalung, Hechingen, Germany) has been reported as a bridge to transplantation in decompensated pulmonary hypertension. The Novalung device is interposed between the pulmonary artery and the left atrium. With this system, no pump is needed, reducing the risk of bleeding. Because of PVR elevation in pulmonary hypertension, blood ejected by the right ventricle is preferentially redirected into the device, immediately reducing the afterload of the right ventricle . The physiological impact of the Novalung on left ventricular function is probably more interesting than ECMO, because its premise is to restore the left ventricular preload which is largely impaired in pulmonary hypertension. The major disadvantage of the Novalung system is the need for sternotomy under general anaesthesia to install and position the device. In our practice, we have mainly used this system in patients who failed pulmonary endarterectomy with severe persistent pulmonary hypertension that precluded weaning from cardiopulmonary bypass . Double lung transplantation in pulmonary hypertension is associated with a higher risk of primary graft dysfunction, mainly due to alteration of left ventricular diastolic function. Normalisation of PVR after graft perfusion leads to a sudden elevation of left ventricular preload, leading to an increased risk of pulmonary oedema. For these reasons, the use of ECMO has been proposed in selected patients during a 48–72 h postoperative period until the end of the period of primary graft dysfunction (i.e. ischaemia-reperfusion lung injuries) [58, 59]. Interestingly, a progressive reversibility of the myocardial remodelling leading to a recovery of a normal right ventricular function was observed after double lung transplantation, even in cases of end-stage right ventricular failure at time of listing. This observation dramatically decreased the indication for heart–lung transplantation. Time to right ventricular recovery after double lung transplantation remains to be determined according to preoperative characteristics. One of the key points in the management of patients with acute decompensated pulmonary hypertension is close monitoring, which is necessary to better assess the haemodynamic situation, evaluate the response to therapy and initiate the decision to activate urgent transplantation and/or ECLS in cases of refractory right ventricular failure (figure 3). In all cases, monitoring the consequences of cardiac failure appears to be important in order to balance metabolic demand and haemodynamic impairment. However, specific studies on this topic in the management of severe pulmonary hypertension in the ICU are lacking. Monitoring tools in acute decompensated pulmonary hypertension. BNP: brain natriuretic peptide; RV: right ventricle; TAPSE: tricuspid annular plane systolic excursion; LV: left ventricle. The clinical presentation of a patient in acute decompensated pulmonary hypertension can often be falsely reassuring at rest. Although systemic arterial pressure at admission appeared to be a prognostic factor , a majority of patients are able to maintain a normal level of systemic vascular resistance for a long time. In contrast, a fall in systemic vascular resistance under diuretic and/or inotropic support treatment appears to be a determining prognostic factor. The necessity of introducing norepinephrine to maintain the systemic pressure is clearly associated with a worse prognosis. Similarly, clinical signs of low cardiac output, such as encephalopathy, restlessness, digestive intolerance, diffuse pain or recurrent syncope frequently appear very late in the end-stage period and should prompt the discussion of the use of circulatory assistance if they do not remit promptly with other medical treatments. In addition, monitoring diuresis and weight in the ICU in order to assess daily water balance are essential to appreciate the evolution of overload and response to diuretic treatment with or without catecholamine support if necessary. The prognostic value of biomarkers such as brain natriuretic peptide or troponin has been demonstrated in several studies [19–21]. Most studies have reported the prognostic impact of these biomarkers at admission to intensive care. It is very likely that the evolution of these parameters under treatment could be more informative, and therefore needs to be evaluated prospectively. Plasma levels of C-reactive protein (CRP) are useful to screen for an infectious process in patients with acute decompensated pulmonary hypertension . However, moderate elevation of CRP associated with fever can be observed in the absence of acute infection, possibly reflecting a systemic inflammatory response syndrome due to acute right cardiac decompensation. Although few studies have assessed sodium and water regulation imbalance in right heart failure, it has been documented that hyponatraemia is linked to survival in stable PAH patients [26, 60]. In addition, a link between hyponatraemia and survival has been demonstrated in acute decompensated pulmonary hypertension . Other biomarkers are used to detect and assess peripheral organ involvement due to the combination of decreased cardiac output and congestion. Indeed, creatinine level appears to be a major prognostic factor in patients with acute decompensated pulmonary hypertension. Transaminase and bilirubin levels are useful to detect acute congestive hepatopathy. Finally, most of these biomarkers reflect advanced right ventricular failure, right ventricular ischaemia or multiorgan failure. Future biological and clinical studies are needed to research and develop more informative and better-performing biomarkers in order to predict outcomes of patients with end-stage disease earlier and more precisely. Although the use of right haemodynamic monitoring by right cardiac catheterisation has been questioned in the management of shock in intensive care, it remains the most effective tool in the evaluation of right ventricular preload, right ventricle afterload and cardiac function in pulmonary hypertension. Right atrial pressure and cardiac output are the main altered parameters in acute decompensation, and have been demonstrated to be major prognostic factors in PAH . However, invasive haemodynamic monitoring in the ICU is not widely used in routine practice, due to a risk of infection and arrhythmia, which may be considered too great in these fragile patients. Ultimately, right heart catheterisation is considered in severe and complex cases after assessing the benefit-to-risk ratio. In patients with a central venous line, it can be useful to monitor the central venous pressure in order to assess evolution of right ventricular preload and improve management of fluid balance with diuretics. In addition, measurement of central venous oxygen saturation is recommended to appreciate tissue oxygenation. This measure is inversely correlated with cardiac function in most cases; however, it must be interpreted with caution because of many other potential factors that can influence it, such as sepsis or anaemia. Echocardiography is an interesting alternative to right cardiac catheterisation. Many echocardiographic parameters are useful to monitor right ventricular preload, right and left ventricular function and right ventricular afterload. Some variables evaluating right ventricular contractile function and right atrial function have shown to be prognostic factors in PAH in the stable clinical scenario [61–63]. Nevertheless, precise assessment of right ventricular function remains a challenge and very few data support its reliability in the setting of acute right heart failure. In the study published by Haddad et al. , tricuspid regurgitation severity was the only parameter associated with a worse prognosis in this population. Additional studies are necessary to evaluate precisely the accuracy of each echocardiographic parameter in this specific setting and their impact on prognosis. Over the past decade, haemodynamic monitoring has evolved considerably in the ICU. Novel noninvasive or minimally invasive techniques have been developed in order to reduce adverse events and provide continuous cardiac output and fluid responsiveness variables in real time . However, these techniques have been studied primarily in sedated patients under mechanical ventilation. In contrast, very few data are available on the performance of these haemodynamic monitoring tools in awake patients hospitalised in an ICU for acute decompensated pulmonary hypertension. Novel devices that use transpulmonary thermodilution-based methods to determine cardiac output have generated great interest in the general ICU population. This technology provides information regarding numerous physiological variables including systemic arterial pressure, cardiac output or stroke volume. This method has never been formally validated in pulmonary hypertension patients to date, and right ventricular dilatation and tricuspid regurgitation are supposed to be major limitations in the reliability of the device. Nevertheless, preliminary data supports its reliability in cardiac output estimation . Fully noninvasive techniques providing cardiac output estimation have been introduced recently. Many new systems have been developed to monitor the cardiac output indirectly, with a continuous analysis of the arterial pressure waveform . These techniques, combined with right ventricular preload estimation with central venous pressure, could be an interesting option in patients with acute decompensated pulmonary hypertension, but remain to be prospectively evaluated. On the basis of cardiac magnetic resonance studies showing reductions in time to peak of shortening of the left ventricular free wall and time to aortic valve closure , our group tested the hypothesis that left ventricular ejection time (LVET) could be reduced as a result of the right-to-left dysynchrony. We used applanation tonometry, a simple, quick, painless and safe noninvasive method for estimating central aortic pressure from a peripheral recording of pulse waves at the radial or carotid artery level. We demonstrated that LVET was associated with cardiac index in stable pulmonary hypertension patients . Furthermore, in a prospective study including pulmonary hypertension patients admitted to the ICU for right heart failure, our group showed that shortening of LVET was associated with a worse outcome . The occurrence of acute right heart failure in patients with precapillary pulmonary hypertension is the most frequent cause of death in this population. Because pulmonary hypertension remains a progressive and fatal disease due to irreversible pulmonary vascular remodelling, right heart remodelling and failure must be considered important targets for future therapies. Over the past decade, the development of ECLS in refractory right heart failure combined with urgent transplantation has probably contributed to a significant improvement in survival for selected patients. However, there remains a considerable need for further research in this field. Specific clinical studies are needed to improve right heart failure understanding and management in the ICU. Pathophysiological mechanisms of right ventricular remodelling must be better understood in order to develop future targeted therapies. Finally, the development of new ECLS techniques as a long-term treatment option for right heart failure, and not only as bridge to transplantation, must be considered a very interesting challenge for the future. Previous articles in this series: No. 1: Kondoh Y, Cottin V, Brown KK. Recent lessons learned in the management of acute exacerbation of idiopathic pulmonary fibrosis. Eur Respir Rev 2017; 26: 170050. Provenance: Commissioned article, peer reviewed. ERR articles are open access and distributed under the terms of the Creative Commons Attribution Non-Commercial Licence 4.0.
. Treatment of pulmonary arterial hypertension. N Engl J Med 2004; 351: 1425–1436. , et al. 2015 ESC/ERS Guidelines for the diagnosis and treatment of pulmonary hypertension: The Joint Task Force for the Diagnosis and Treatment of Pulmonary Hypertension of the European Society of Cardiology (ESC) and the European Respiratory Society (ERS). Eur Heart J 2016; 37: 67–119. , et al. 2015 ESC/ERS Guidelines for the diagnosis and treatment of pulmonary hypertension. The Joint Task Force for the Diagnosis and Treatment of Pulmonary Hypertension of the European Society of Cardiology (ESC) and the European Respiratory Society (ERS). Eur Respir J 2015; 46: 903–975. , et al. Advances in therapeutic interventions for patients with pulmonary arterial hypertension. Circulation 2014; 130: 2189–2208. , et al. Survival in patients with idiopathic, familial, and anorexigen-associated pulmonary arterial hypertension in the modern management era. Circulation 2010; 122: 156–163. , et al. Predicting survival in pulmonary arterial hypertension: insights from the Registry to Evaluate Early and Long-Term Pulmonary Arterial Hypertension Disease Management (REVEAL). Circulation 2010; 122: 164–172. , et al. Right heart adaptation to pulmonary arterial hypertension: physiology and pathobiology. J Am Coll Cardiol 2013; 62: Suppl. 25, D22–D33. , et al. Contemporary management of acute right ventricular failure: a statement from the Heart Failure Association and the Working Group on Pulmonary Circulation and Right Ventricular Function of the European Society of Cardiology. Eur J Heart Fail 2016; 18: 226–241.
. Pathophysiological basis of right ventricular remodeling. J Cardiovasc Pharmacol Ther 2007; 12: 5–14.
. The right ventricle in pulmonary arterial hypertension: disorders of metabolism, angiogenesis and adrenergic signaling in right ventricular failure. Circ Res 2014; 115: 176–188. , et al. The right ventricle under pressure: cellular and molecular mechanisms of right-heart failure in pulmonary hypertension. Chest 2009; 135: 794–804. , et al. Clinical and prognostic relevance of echocardiographic evaluation of right ventricular geometry in patients with idiopathic pulmonary arterial hypertension. Am J Cardiol 2011; 107: 628–632. , et al. Treatment goals of pulmonary hypertension. J Am Coll Cardiol 2013; 62: Suppl. 25, D73–D81. , et al. Septal curvature is marker of hemodynamic, anatomical, and electromechanical ventricular interdependence in patients with pulmonary arterial hypertension. Echocardiography 2014; 31: 699–707. , et al. Is right ventricular remodeling in pulmonary hypertension dependent on etiology? An echocardiographic study. Echocardiography 2016; 33: 546–554. , et al. Differences in right ventricular functional changes during treatment between systemic sclerosis-associated pulmonary arterial hypertension and idiopathic pulmonary arterial hypertension. Ann Am Thorac Soc 2017; 14: 682–689. , et al. Characteristics and outcome after hospitalization for acute right heart failure in patients with pulmonary arterial hypertension. Circ Heart Fail 2011; 4: 692–699. , et al. Prognostic factors and outcomes of patients with pulmonary hypertension admitted to the intensive care unit. J Crit Care 2012; 27: 739.e7–739.e13. , et al. Characteristics and prognosis of patients with decompensated right ventricular failure during the course of pulmonary hypertension. Kardiol Pol 2008; 66: 1033–1039. , et al. Outcomes of hospitalisation for right heart failure in pulmonary arterial hypertension. Eur Respir J 2011; 38: 359–367. , et al. Prognostic factors of acute heart failure in patients with pulmonary arterial hypertension. Eur Respir J 2010; 35: 1286–1293. , et al. Renal replacement therapy in patients with severe precapillary pulmonary hypertension with acute right heart failure. Respiration 2013; 85: 464–470. , et al. Left ventricular ejection time in acute heart failure complicating precapillary pulmonary hypertension. Chest 2013; 144: 1512–1520. , et al. Intravenous fasudil improves in-hospital mortality of patients with right heart failure in severe pulmonary hypertension. Hypertens Res 2015; 38: 539–544.
. Cardiorenal syndrome: refining the definition of a complex symbiosis gone wrong. Intensive Care Med 2008; 34: 957–962. , et al. Association of serum creatinine with abnormal hemodynamics and mortality in pulmonary arterial hypertension. Circulation 2008; 117: 2475–2483. , et al. Dysregulated renin-angiotensin-aldosterone system contributes to pulmonary arterial hypertension. Am J Respir Crit Care Med 2012; 186: 780–789. , et al. Incidence and clinical relevance of supraventricular tachyarrhythmias in pulmonary hypertension. Am Heart J 2007; 153: 127–132. , et al. Deleterious effects of beta-blockers on exercise capacity and hemodynamics in patients with portopulmonary hypertension. Gastroenterology 2006; 130: 120–126. , et al. Amiodarone as a first-choice drug for restoring sinus rhythm in patients with atrial fibrillation: a randomized, controlled study. Chest 2000; 117: 1538–1545. , et al. The management of supraventricular tachyarrhythmias in patients with pulmonary arterial hypertension. Heart Lung Circ 2016; 25: 442–450. , et al. Infections liées aux cathéters veineux centraux tunnélisés chez les patients ayant une hypertension artérielle pulmonaire traitée par prostacycline intraveineuse [Tunnelled central venous line-associated infections in patients with pulmonary arterial hypertension treated with intravenous prostacyclin]. Presse Med 2016; 45: 20–28.
. Intensive care unit management of patients with severe pulmonary hypertension and right heart failure. Am J Respir Crit Care Med 2011; 184: 1114–1124. , et al. Long-term intravenous epoprostenol infusion in primary pulmonary hypertension: prognostic factors and survival. J Am Coll Cardiol 2002; 40: 780–788. , et al. Effects of norepinephrine and dobutamine on pressure load-induced right ventricular failure. Crit Care Med 2004; 32: 1035–1040. , et al. 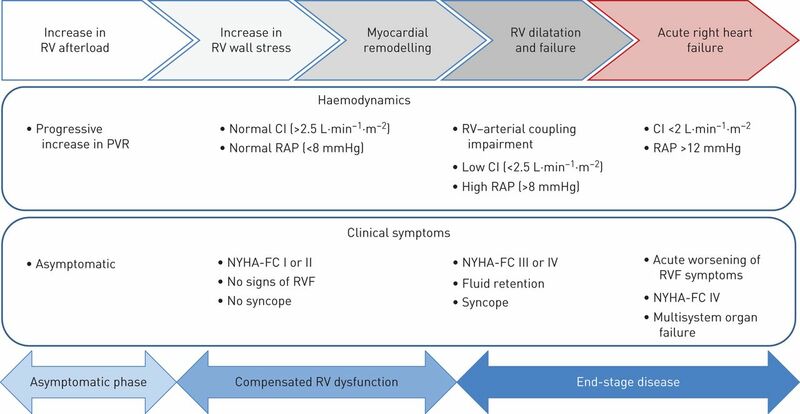 Pulmonary vascular and right ventricular dysfunction in adult critical care: current and emerging options for management: a systematic literature review. Crit Care 2010; 14: R169. , et al. GRK2-mediated inhibition of adrenergic and dopaminergic signaling in right ventricular hypertrophy: therapeutic implications in pulmonary hypertension. Circulation 2012; 126: 2859–2869. , et al. Acute hemodynamic effects of intravenous sildenafil citrate in congestive heart failure: comparison of phosphodiesterase type-3 and -5 inhibition. J Heart Lung Transplant 2009; 28: 676–682. , et al. Acute effects of levosimendan in experimental models of right ventricular hypertrophy and failure. Pulm Circ 2014; 4: 511–519. , et al. Effects of levosimendan versus dobutamine on pressure load-induced right ventricular failure. Crit Care Med 2006; 34: 2814–2819. , et al. Upfront triple combination therapy in pulmonary arterial hypertension: a pilot study. Eur Respir J 2014; 43: 1691–1697. , et al. Immunosuppressive therapy in lupus- and mixed connective tissue disease-associated pulmonary arterial hypertension: a retrospective analysis of twenty-three cases. Arthritis Rheum 2008; 58: 521–531. , et al. Severe pulmonary arterial hypertension secondary to lupus in the emergency department: proactive intense care associated with a better short-term survival. Int J Rheum Dis 2015; 18: 331–335. , et al. Pulmonary veno-occlusive disease. Eur Respir J 2016; 47: 1518–1534. , et al. Chronic thromboembolic pulmonary hypertension. J Am Coll Cardiol 2013; 62: Suppl. 25, D92–D99.
. Organ allocation in lung transplant. Chest 2007; 132: 1646–1651. , et al. Transplantation for idiopathic pulmonary arterial hypertension: improvement in the lung allocation score era. Circulation 2013; 127: 2503–2513. , et al. Impact of the lung allocation score on lung transplantation for pulmonary arterial hypertension. Am J Respir Crit Care Med 2009; 180: 468–474. , et al. The REVEAL Registry risk score calculator in patients newly diagnosed with pulmonary arterial hypertension. Chest 2012; 141: 354–362. , et al. Introduction of the lung allocation score in Germany. Am J Transplant 2014; 14: 1318–1327. , et al. Lung transplantation in Germany since the introduction of the lung allocation score. Dtsch Arztebl Int 2017; 114: 179–185. , et al. Impact of high-priority allocation on lung and heart-lung transplantation for pulmonary hypertension. Ann Thorac Surg 2017; 104: 404–411. , et al. Bilateral lung transplantation with intra- and postoperatively prolonged ECMO support in patients with pulmonary hypertension. Eur J Cardiothorac Surg 2002; 21: 858–863. , et al. Extracorporeal membrane oxygenation as a bridge to lung transplantation and recovery. J Thorac Cardiovasc Surg 2012; 144: 716–721. , et al. Impact of extracorporeal life support on outcome in patients with idiopathic pulmonary arterial hypertension awaiting lung transplantation. J Heart Lung Transplant 2011; 30: 997–1002. , et al. Bridge to thoracic organ transplantation in patients with pulmonary arterial hypertension using a pumpless lung assist device. Am J Transplant 2009; 9: 853–857. , et al. Extracorporeal life support after pulmonary endarterectomy as a bridge to recovery or transplantation: lessons from 31 consecutive patients. Ann Thorac Surg 2016; 102: 260–268. , et al. Extracorporeal life support in lung and heart-lung transplantation for pulmonary hypertension in adults. Clin Transplant 2016; 30: 1152–1158. , et al. Lung transplantation for severe pulmonary hypertension – awake extracorporeal membrane oxygenation for postoperative left ventricular remodelling. Transplantation 2015; 99: 451–458. , et al. Hyponatremia predicts right heart failure and poor survival in pulmonary arterial hypertension. Am J Respir Crit Care Med 2008; 177: 1364–1369. , et al. Tricuspid annular displacement predicts survival in pulmonary hypertension. Am J Respir Crit Care Med 2006; 174: 1034–1041. , et al. Echocardiographic predictors of adverse outcomes in primary pulmonary hypertension. J Am Coll Cardiol 2002; 39: 1214–1219. , et al. Value of a Doppler-derived index combining systolic and diastolic time intervals in predicting outcome in primary pulmonary hypertension. Am J Cardiol 1998; 81: 1157–1161. , et al. Less invasive hemodynamic monitoring in critically ill patients. Intensive Care Med 2016; 42: 1350–1359. , et al. Accuracy of transpulmonary thermodilution cardiac output measurement (PiCCO) in patients with right heart failure (RHF) due to precapillary pulmonary hypertension (PH). Eur Respir J 2013; 42: Suppl. 57, P3402.
. Noninvasive cardiac output monitors: a state-of the-art review. J Cardiothorac Vasc Anesth 2013; 27: 121–134. , et al. Interventricular mechanical asynchrony in pulmonary arterial hypertension: left-to-right delay in peak shortening is related to right ventricular overload and left ventricular underfilling. J Am Coll Cardiol 2008; 51: 750–757. , et al. Relation between left ventricular ejection time and pulmonary hemodynamics in pulmonary hypertension. Int J Cardiol 2015; 184: 763–765.